I arrived in Berlin from South Africa on the 8th of August – a day that was very memorably the kind of hot that had sweat droplets budding from one’s pores seemingly instantly after they were wiped away – in the same fashion I believe most Euro virgins do: unbathed, unslept, unattractive, and excited. Ignoring the prodigious weight of my suitcases, crammed with what then seemed like the most ludicrously inappropriate (warm and fluffy) apparel, I stumbled enthusiastically through Tegel Airport to meet the Bard College Berlin staff member that would guide me to my new home for the next four years. Despite the lack of sleep, I felt electrified. I had resolved to make a conscious effort to remember my first impressions of the city. From inside the airport, already I attempted to piece together a profile of the Berliner population. There were all sorts there: Young and old, families and businessmen, the practically dressed and the stylish. What struck me most was the variety of skin tones: creams gave way to toffees, toffees to chocolates, chocolates to coffee. All were on the move. Their footsteps resounded in the low ceilinged hall. It was a buffet for the senses. I knew that airport goers would not necessarily be representative of city goers, but I nonetheless took pleasure in observing the ebb and flow of the multihued people. There aren’t many places where one can find such diversity. Then I was on the road, bundled into a taxi with another freshman and the upperclassman that had received us. (Side note: If you happen to be visiting or are similarly new to Berlin, don’t step into a taxi if you aren’t prepared to pay a steep price. You will be better off with public transport. Don’t be scared of getting lost. If you do, there is bound to be someone around that will point you in the right direction). Within a few minutes we were out of sight of the airport, coasting through the city. It all went by too quickly for me to notice anything in particular. The one word that looped through my mind excitedly was Green! Green! It was everywhere. Pure and innocent green was on all sides, seeming to welcome me with its tender embrace. No one had told me the city would be so lush. The heat finally broke two weeks later; the sun hid for a while. Now it has returned. No one had told me Berlin would be so flat. This is apparently because of the bombing during World War II. The flatness is disorienting. In my time here, I have walked and walked and still have no conception of the size of the city. The only way I imagine one can truly get to know any place is by walking and, ideally, getting moderately lost. This last clause is easier for some to accomplish than it is for others. I myself boast a great aptitude for it. If you are not so fortunate, I advise that you pair up with someone who is and allow them to lead you to nowhere in particular. Then, when things become dire, you may take charge. Even as I have explored the city further, my very first impressions of it have remained with me. The leaves have not yet begun to turn colour. The people here are, indeed, many and varied. The city sprawls. 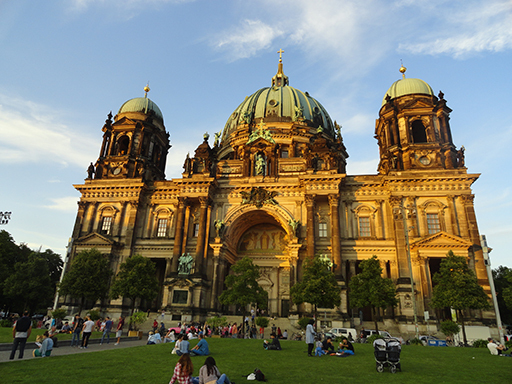 What else you might have heard of Berlin is probably true. The nightlife is vibrant. Most Germans here don’t smile at strangers. Beer is usually cheaper than water. The Berlin Bears are endearing and ubiquitous. The public transport is excellent – clean and timely. I think public transport really deserves more than a mention. Having lived only in developing countries the past eight years of my life, I have a hard time believing that a public service of any kind can possibly function so smoothly. It’s almost magical. Has anyone else noticed how the bus slightly tips itself at stops, with the hiss of pistons, closer to the pavement to allow for easier embarkation and disembarkation? Or how there is a square of floor that can be partially collapsed at the entrance of the trams so that a wheelchair can be rolled onto and off the platform? Have you seen the magnificently vaulted ceilings of some of the S-bahn stops, or the aesthetically pleasing arrangement of different coloured bricks in the walls of others? And the parks! There are simply so many, and so many that are well cared for. They sneak up on you. I was walking in the Eastern city center with a friend who had come to visit when we turned into a gated alley, and there it was: a fairy-like playground ringed in by apartment buildings. The hum of city life was cut off at the mouth of the alley and replaced by the bubbly giggles of children. Idyllic. Clean, green, flat, and functional. These are my impressions of Berlin. I realise this is not the sexiest of portrayals. But don’t let me mislead you. It is enchanting and nuanced. Walking along the spacious streets, one gets the feeling that interesting and important things are happening all around you, even if they are not always readily apparent. At night, it is easy to stumble upon street music and laughter (At least for now, before the sun slinks away again). There is a happiness and humanity here more pervasive than I’ve seen in any other place. Of course, Berlin is not all fairies and rainbows. I have also seen poverty here. It surprised me. I am accustomed — as much as one can be — to the poverty of my nation, where skeletal children beg at traffic lights and where mothers rent their babies out to other beggars as props to inspire greater sympathy. In my country, poverty knocks at your car window, makes eye contact, cups its hands and pleads. It is desperate. The poverty here is different: it is not that of desperation or starvation — it is that of shame. The poverty here is quiet. It lies silently under bridges, piled with blankets, hiding its face in mock slumber. Or it sits stoically at street corners amongst its few possessions, eyes fixed intently upon nothing while crowds of pedestrians tread carefully around it. Then there is the greyness. I don’t mean just the weather — which I hear gets worse in winter — but also the uninspiring uniformity of the Communist architecture of former East Berlin, where Bard College Berlin is situated, and the lazy graffiti tags that abound in public places. Even someone like myself who is generally not informed about the world can see that the city’s famous fluidity has not effaced the stain of history. Though Berlin has its dark side, as all peoples and cities do, it seems to me the right place to be. For now, Berlin, I am impressed.